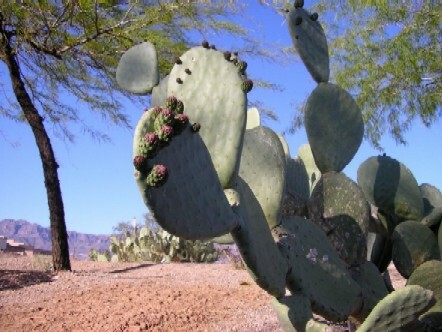 The Prickly Pear, is a very drought resistant and tough plant that is very common in Arizona. The specific name is known as Opuntia phaeacantha. In Spanish, this plant is called "tuna." The benefits are many! The fruit of this Nopal Cactus is known for helping treat diabetes, high cholesterol, as well as inflammation. Many people eat this cactus for its health benefits as well as its flavor! Most of what you see on this cactus are the pads, which are referred to as "nopales or "nopalitos." 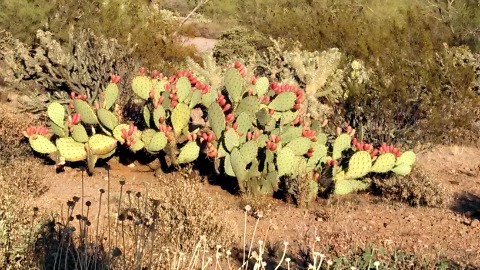 This cactus fruit in arizona is found in the deserts of our desert southwest. This cactus fruit is a very hearty plant here in the southwest and it can survive without water for long periods of time. It easily stores water within the plant and when rain is adequate, the nopales will become twice as thick. The Prickly Pear will adapt to many different locales as well as elevations. You will typically find the it in areas where the soil is well drained soil and dry, which is almost never an issue here in the desert! They also like areas consisting of rocky flats or slopes and are also common in the more rugged terrain such as the mountainous foothills. Not only will see this plant thriving on the desert floor of the Sonoran Desert, you will also find them in grocery stores! Yes, you heard that right. This cactus is actually very tasty and has many health benefits. Rich in vitamin C,fiber, vitamin B-6, potassium, calcium and magnesium, the Prickly Pear is also low in calories. In fact, an 8-ounce serving of the raw fruit will only set you back a mere 61 calories and an 8-ounce serving of the raw nopales, or the pads of the cactus are only 14 calories. So if you are counting calories, the Prickly Pear might just be the way to go. I have also heard that this plant is good in salads. You simply peel the skin off and boil the rest of the plant and let it cool. After it has cooled to the touch, you can add it to virtually any salad of your choice. One word of caution, though, like any wild plants here in Arizona, the Prickly Pear cactus is federally protected by law. Therefore, neither the fruit or the pads cannot be picked without a permit. As I said, you can purchase them in many grocery stores here in Arizona, found in the fruits and vegetables section. You can also order many products online that specialize in using the cactus for gourmet foods. Some grocery stores such as Food City and Bashas', sell food items containing this delicious fruit as well as the nopalitos. You can also find them at many of the swap meets here in Arizona, too. If you are anxious to try the fruit of the Prickly Pear, you will have to wait for summer, particularly in June through August, when the fruit ripens. You will also find it used in jellies, syrup as well as Tequila. I have not tried the syrup or the tequila, (although I have heard that the tequila is really good!) but I have tried the jelly and salad dressing and believe me, it is delicious! We know of a business here in Phoenix that sells some of these most delicious food items that contain this amazing and magical desert fruit. Their name is Mama Rose's and you can purchase their foods online at mamarosefoods.com You will also find some great recipes there as well as a cook book containing very easy to make recipes... seriously, they are easy and delicious. If you would like to learn more about this plant and get a "birds eye view" of this Arizona cactus fruit and other southwest desert flowers, the Desert Botanical Garden in Phoenix is a great place to visit. Their address, phone and hours of operation are listed below for your reference. The Desert Botanical Garden is open seven days a week, year round except for July 4, Thanksgiving Day and December 25. There are certain trails that the garden closes during the evening hours, so you may wish to call ahead for information regarding hours on their open trails. Above is a picture that I took of the cactus here in Gold Canyon. What a beautiful shot. I took the picture during spring as the cactus was beginning to bloom.